It’s official: We’ve teamed up with MakerBot, the leading manufacturer of consumer-friendly desktop 3D printers, to offer the 3Dponics Customizer as a MakerBot-Ready App. It’s now one of a few MakerBot-Ready Apps, all of which help people discover 3D printing in educational and fun ways. Download the customization app for free. Modify the original designs for the 3Dponics parts (the conduit, silencer and drip nozzles) to create ones that are completely your own—ones that perfectly suits the hydroponics garden of your dreams. Save your altered designs. 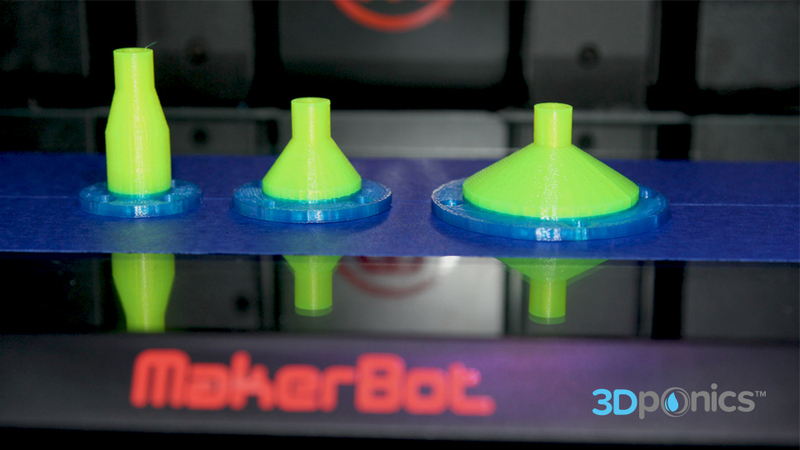 The new, saved files immediately transfer to your MakerBot 3D printer, where they are stored and ready to print. Connect your MakerBot to WiFi. Open your Library to access the MakerBot-Ready Apps portal. Getting started in additive manufacturing can be intimidating, as is the case with any new project or technology. We want to make it as easy and as fun as possible for people of all ages, and so does MakerBot. When you build this open-source system, whether you print the original parts or design your own, you take on a project that doesn’t require existing skill or experience in 3D printing. You learn lessons in sustainability, science, technology, engineering, mathematics (STEM) and even 3D design. We believe in innovation through collaboration. This customization app gives you control over your 3D-printed hydroponics parts and encourages you to get creative with your designs. And now, because the 3Dponics Customizer is a MakerBot-Ready App, you can quickly and easily access your new designs on your Fifth Generation Replicator and print in seconds. So get started, and don’t forget to share your progress with the 3Dponics online community.